This entry was posted in Books, Sock knitting, Yarns and tools. Bookmark the permalink. The socks look great! He is lucky to have “famous” socks knit on national TV. They are wonderful. Hi Judy, I think so, too, but after wearing them a day, I’m hearing noises about his wishing they were a little tighter in the legs!! So, maybe they will get washed and go to my middle brother who is a woodcarver and has wider ankles!! 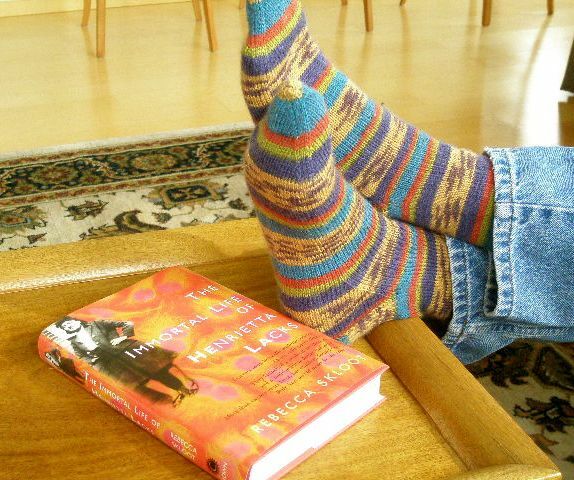 I guess when one has 26 pair of handknit socks one can get a bit picky! I did love the colors and the yarn is just great! Love the socks! I’m really looking forward to the revised “Knit Socks” this September! Such beautiful socks! I had to have them, so immediately purchased the same yarn, same colorway. However, my yarn is much darker in color and the stripe sequence appears to be different! Do you think they may have changed this yarn? I really don’t know, Barbara. On my computer monitor, the colors seemed to be pretty true. I know that there is a great deal of variation, however, from monitor to monitor. My yarn was not dark but rather very bright. One way you could find out about this is to contact Kristin Nicholas who designed the yarn for Nashua. Her blog is listed on my blogroll. 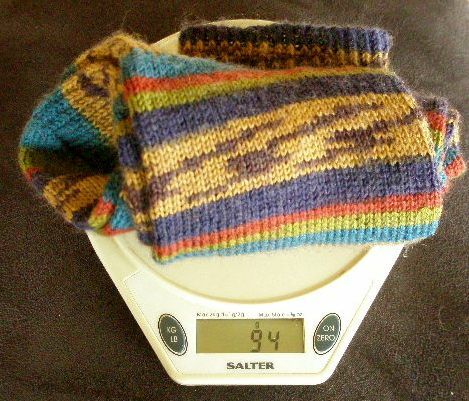 My Kristin Nicholas yarn was 105 grams and my Mellenweit Fantasia was 145 with the ball band when it says 150. 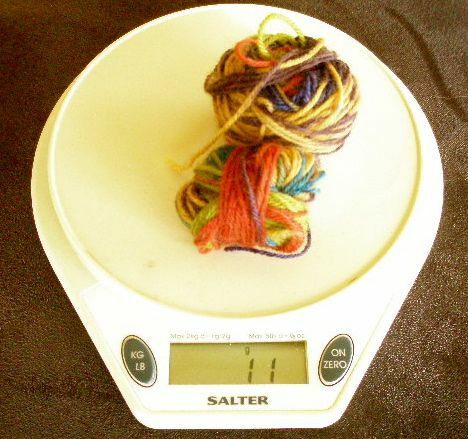 It never occurred to me to check the weight of sock yarn before your blog. I had to have that Plum yarn too despite other things on the needles and they are coming long.